GummyBerry contains fine holographic glitter with white and black hex and bar glitter all in a deep berry colored jelly base. All nails are 2 coats with top coat. Nicole, the creator of GlitterBunny Polish, does note her polishes are bit thicker and some need glitters may need to be "placed". I personally found that with GummyBerry this was semi-accurate. I didn't have a problem with getting any glitter out or having to place it where I wanted. It was a little thicker, but in my experience similar to any jelly polish. Dry time was average, again something I find with most jellies. :) The color and over all look is awesome! I love the squishiness it gives off and the base color is amazing! I Got a Goodie Bag has various colors, finishes, and sizes of square glitter in a clear base with fine holographic glitter. I layered 1 coat of I Got a Goodie over 3 coats of L'Oreal Lilac Coolers with top coat. Krazy Straws is described as various neon glitters in a clear base. I started with Pure Ice Touch of Glamour with 2 coats of Krazy Straws and top coat. Part of That World is a shimmery dark blue jelly base with small turquoise glitter and medium sizes purple squres. All nails are 2 coats with top coat. You can purchase GlitterBunny Polish through their BigCartel storefront. Currently I Got a Goodie Bag and Krazy Straws are out of stock but as Nicole has told me they should be in stock in 2 weeks. 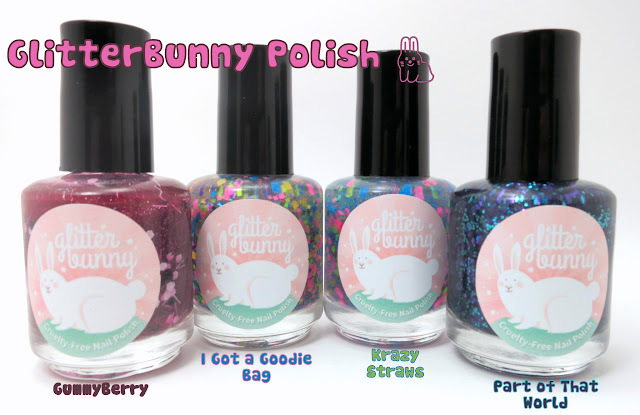 :) Make sure to Follow GlitterBunny Polish on Facebook to stay updated with restocks and new colors.